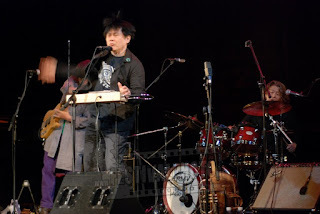 Hikashu in A B Series at the National Arts Centre, Ottawa, Canada on May 15, 2013. Go see them and be shocked. On May 10, shortly before the Canada tour, Hikashu's pianist Shimizu Kazuto appeared on a radio program of CKCU-FM (wikipedia), a Canadian community radio station in Ottawa, via telephone and answered some questions about the band and the tour. You can also listen to some tracks from the band's latest album, Uragoe. The program is now archived on their site and can be heard on demand. Just click the link below. Shimizu's interview starts at 32:00. Makigami Koichi, the leader of Hikashu, gives a demonstration of Theremin in Ottawa on May 15, 2013. The admission is free. He has been using the instrument in public since circa 2003. As being asked why he decided to play it, he explained that it could add electronics flavor to the band's sound. Synthesizer has been one of important elements for the Hikashu's sound, and there are always members dedicated to the instrument from the start. But Shimizu Kazuto join the band in 2003, there was no other member playing synthesizer in the band. And being a multi-instrumentalist, he switches acoustic piano and bass-clarinet as well, so he couldn't always play synthesizer. That's why Makigami decided to try Theremin. Now he has established his own, original style on the instrument, as he has done with his voice. It's so dynamic - not only sound-wise but visually. When playing it, he's often moving swiftly around the instrument, in the literal sense of the word. Some even call his style "kung-fu theremin." That description is apt in some way, because in fact he practises chinese martial arts; he's even been qualified as instructor. The demonstration itself is a free event and held in afternoon, which is preceded the Hikashu's concert in the evening of the same day. So if you are in Ottawa and haven't decided to go to the band's gig, just give it a try and attend the demo. It's free and really accessible. And if you like what you see, go to the band's gig in the evening. Hikashu front man, Koichi Makigami gives Theremin demonstration! 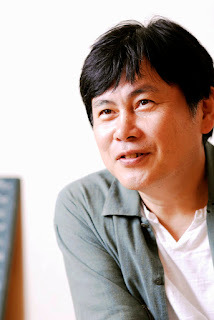 Interview with Makigami Koichi: "We really look forward to visiting Canada." 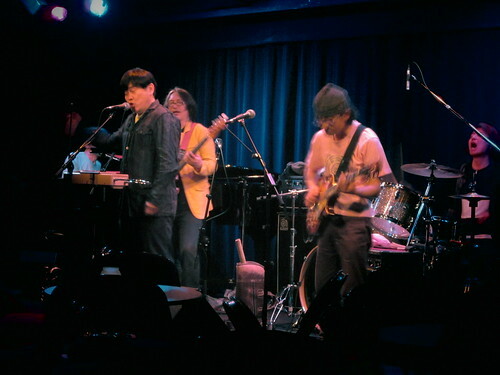 On May 3, we met Makigami Koichi, the leader of Hikashu, at LaMama of Shibuya, Tokyo where he appeared as a prompter of John Zorn's Cobra, and had a chat with him about the forthcoming Canada Tour of the band. This is the first time ever for the band playing in the country. Would you tell us how this tour happens in the first place? It's thanks to Michel san. He's the general and artistic director of the Festival International de Musique Actuelle de Victoriaville [FIMAV]. I sent him a copy of Uragoe [Hikashu's latest album]. He quite liked it, and offered us to appear in the Victoriaville festival. Not only that, but he arranged a tour in the country. As a matter of fact, for the Ottawa's gig I was booked as solo artist. Even in the first place, it was originally proposed as an event for sound poem. But being heard of Hikashu's visit to Canada, the organizer graciously decided to change the program and book the band instead. How about your impressions of Canada as country? Well, mention of the country instantly makes me think of the Victoriaville festival because I've appeared there several times before, and I know the festival is really great. The first time I performed there as a member of the group called the Five Men Singing. The performance has been released on CD as well ("Five Men Singing," Victo, 2004). Then in 2011, I appeared there with АЯ [pronounces "Aya," sometimes billed as Tokyo Taiga - a trio with Bolot Bairyshev from the Altai Republic, and Sato Masaharu, the Hikashu's drummer]. This year there's John Zorn @ 60, and I can hardly wait to see the special program. You have performed in other parts of the country. I've been in Canada for four or five times. At a festival in Vancouver, I appeared with other voice performers like Paul Dutton from the Five Men Singing, and Sainkho Namtchylak‎. For this tour, I'm looking forward to seeing Nobuo Kubota's performance in Ottawa. He'll perform on the same stage with us. I've heard he is a Japanese Canadian artist based in Toronto. Speaking of Canadian artists, you saw Buffy Saint-Marie performing before. It was 1970. I went to a music festival called Hakone Aphrodite and saw her there. I was impressed. She played mouth bow as well. I too play mouth harp, and I think I was somewhat influenced by her. I also saw there other acts like the 1910 Fruitgum Company, and Pink Floyd. Pink Floyd brought their own PA, and played very loud. A few years later, I went to London and participated in a fringe theatre called "Lumiere & Sons" as stage actor, and I met Roger Waters there! He was a sponsor of the theatre. Plan to do some sightseeing? We'll go to see Niagara Falls, but that's it. 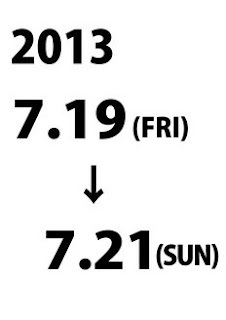 Unfortunately, the schedule is very hectic. After the Canada gigs, you'll go to New York and record an album. Have you already had enough material? Right now, we've had four songs. Other than that, I've written three or four lyrics. So surely it looks no problem. Anything to the audience in Canada? I bet you'll like the band. We really look forward to seeing you. Hikashu members apparently delight in visiting Canada. On April 12, the last gig before the tour, during a break on stage, they mentioned the tour and listed Canadian artists like Leonard Cohen, Gordon Lightfoot, The Guess Who, Backman Turner Overdrive, Neil Young, Céline Dion, Gino Vannelli, and k.d. Lang etc. Do not miss this premiere appearance of Hikashu in Canada. Hikashu is now preparing material for next album. Recently the band had a meeting and discussed the recording session which will be held at Eastside Sound in New York City this month. Unlike last time, the band has decided to prepare materials to be recorded beforehand, because the schedule is so hectic. For the Uragoe session in 2011, they wrote compositions on the spot, but this time that's difficult. They have four gigs to be played in Canada before reaching New York, and simply have no time to prepare materials enough for an album. According to Makigami, the compositions the members brought are just "intense." How promising. The first announcement of this year's line-up is just came as follows. Quite expecting. Especially, Hikashu with Lauren Newton - this is the first time for them playing together since 1996. Of course, this is not complete. We'll let you know the final line-up and time schedule when available. Ticket on-sale date is currently scheduled to May 18 (saturday). On April 29, Mita Freeman held the second gig of his standards project at Koen-Dori Classics in Shibuya. Being the same as last time, the singer's ccompaniment was Shimizu Kazuto on piano, who is also the musical director of the project. The set list was also mostly the same, although some curious selections were occasionally thrown in, like Kraftwerk's "Showroom Dummies," and surprisingly, a yet-to-be-recorded new song for Hikashu's next album. Their next appearance is a jazz club called Analog in Hamamatsu city on June 26. Then maybe they will get a slot at Jazz Art Sengawa.